I got my hands on the CoMax from Addent a couple of weeks ago, and now you couldn't get it back if you tried to pry it out of my grip. Addent is a great company that keeps succeeding in making "better mousetraps" for our profession. 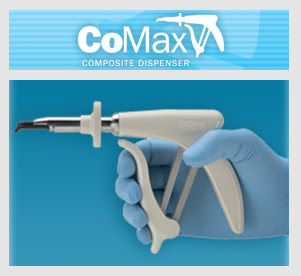 In the case of the Comax they've come up with a better composite dispensing device. The CoMax is a typical gun style dispenser that is anything but typical. The device is incredibly sturdy, just pick one up and you'll know what I mean. The plastic is glossy and easy to clean and made to resist discoloring from repeated steam autoclaving. The stainless steel inner workings provide an amazing mechanical advantage that make dispensing composite considerably easier than with any other gun dispenser currently on the market. It will accommodate all composite cartridges and can be unloaded with one hand. Simply pull back the knob on the barrel with your index and middle fingers and the empty cartridge falls out. Place another in the barrel, release the knob, and the cartridge is loaded and ready for use. If you are suffering with or concerned about carpal tunnel or if you are just tired of fighting the old composite guns (and who of us isn't?) then give the CoMax a try. This is a great improvement on something that you'll use every day. The device is highly recommended. For more info go to the Addent website.